Top 10 'Florida Man' Stories: Alligators, Drugs And Theft Are Common Mirror, mirror on the wall, who's the most Florida of them all? A new top 10 list of bizarre stories from a Miami-based injury claims company attempts to answer that question. 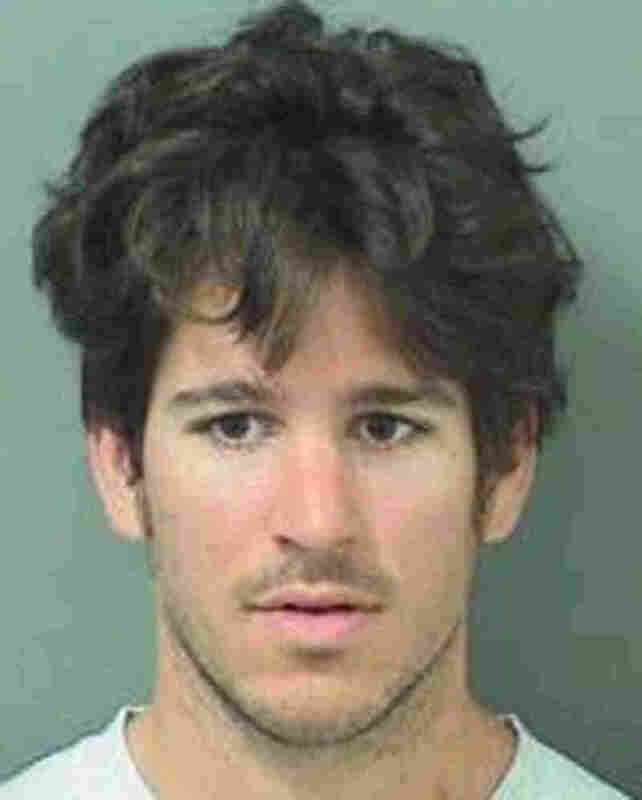 Joshua James was charged with assault with a deadly weapon after officials said he threw an alligator into the kitchen of a fast food restaurant in Loxahatchee, Fla., on Oct. 12, 2015. Throwing an alligator through a Wendy's drive-through window? In October 2015, Joshua James became a classic example of a so-called Florida Man when he threw a live, 3-foot alligator through the drive-through window of a Wendy's in Loxahatchee, Fla. It's an action that earned him charges of unlawful possession and transportation of an alligator, as well as a top spot on a new list of the top 10 Florida Man stories. What exactly is a Florida Man? The Miami Herald's Howard Cohen started listing a few hallmarks of a typical Florida Man story to NPR's Lulu Garcia-Navarro. "A Florida Man tends to generally have to have firearms, locations help — bodies of water, theme parks, Walmarts, Taco Bells, fast food places like that — alligators for sure, reasons for arrest, injuries," Cohen said. "Drugs and alcohol could be part of it, and like we said, animals, and those would include reptiles in particular." The volume of wacky stories involving elements like these in Florida led to the trope of a Florida Man becoming infamous. In 2013, a Twitter account popped up devoted to curating these stories, and Florida Man quickly became a meme known as "the world's worst superhero." Not to be left out, a Florida Woman Twitter account quickly followed, proving that absurdity exists among all genders. Wondering how to assess the true level of Florida-ness in a Florida Man or Florida Woman story? As it turns out, a new analysis of Florida Man stories, conducted by the Miami-based Injury Claim Coach, looks at precise percentages of Florida hallmarks present in sample Florida Man articles. For example, 13.3 percent of their sample articles involved alcohol, 12.5 percent involved assault without a deadly weapon and 4.9 percent mentioned alligators. From this, the Injury Claim Coach's team created the F.L.O.R.I.D.A. man Scoring System to "quantify the Florida Man-ness of any news article appearing on the web." There's one more key characteristic to Florida Man, though: humor. "For the most part they're wacky and, like, you just laugh," Cohen said. But why are there so many wacky people in Florida? Part of it is due to the state's open record laws, he said. These laws allow reporters to access police reports and mug shots. "So those stories are accessible. A lot of times the mug shots are telling in themselves," Cohen said. "Florida has just this reputation. I don't know if it's because it's so far down south everything wacky settles — just falls from the top of the state and rolls down here." Mirror, mirror on the wall, who's the most Florida of them all? #2. Florida man and reptile store owner, Benjamin Herman Siegel, slapped his employees with a bearded dragon lizard after swinging it around in the air. He also put the lizard in his mouth during the odd attack. #6. A naked Florida man, John Hennessey, danced in a fire and chanted in gibberish while wielding a knife. When officers arrived on scene, he grabbed a large wooden stick and started swinging it at them. Police later guessed that Hennessey may have consumed psychedelic mushrooms. #8. Florida man Klaid Karpuzi was released from jail on an auto theft charge. Soon after he walked out the door, he broke into another car in the jail's parking lot. But he didn't notice a deputy sitting in the car that he had just tried to break into. So he was caught and marched right back into jail for a second attempted auto theft charge. Of this story, Cohen asked, "Can you get a better Florida Man than that? " #9. Florida man Sean Johnson walked into a Walmart and took a stuffed horse toy off a shelf. He then went to the store's bedding department, where police said he masturbated using the stuffed animal. Afterward, he put the toy, covered in his DNA, back on the shelf. Florida man Dominick Breedlove interviewed for a job at a Kohl's. Moments after the interview, Breedlove was caught shoplifting two pairs of women's running shoes from the same store. NPR's Amanda Morris produced this story for digital. NPR's Sophia Boyd produced this story for broadcast.